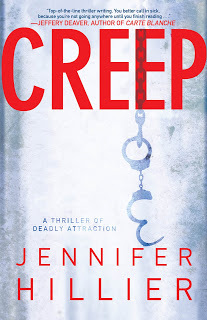 Jennifer Hillier makes her fiction debut with Creep, a thriller sure to keep you on the edge of your seat. Dr. Sheila Tao, professor of psychology, doesn’t know what she is in for when she ends a months long affair with her teaching assistant, Ethan Wolfe. Newly engaged to an investment banker, Sheila’s conscience steers her toward this decision. Ethan isn’t accustomed to being turned down and his obsession with her grows. A cat-and-mouse game begins with blackmail and threats. While evading Ethan’s determined will, one of her students is found stabbed to death. Can she escape his clutches without her colleagues or her fiance’ discovering her most intimate secrets? At first, you might believe you know where this novel is going, but don’t write it off so easily. The surprising end has an unexpected twist. So, cancel your plans and settle in because this book is difficult to put down.